Major China mould production bases are located in Guangdong, Zhejiang, Jiangsu, Shanghai and Anhui. Guangdong: China mould market leader, foreign-funded companies as the mainstay. Guangdong Province has more than 10,000 mould manufacturing companies, employing over 30 million people. The number of firms, employees, total industrial output value and export ranking the first in China. Today, Guangdong is Chinese leading mould market, and is the largest mould export and import province. In China, more than 40% of the mould value comes from Guangdong (mainly in Shenzhen, Dongguan), and the performance of NC mould processing equipment, technology, production standards and the degree of specialization leading other domestic provinces. Zhejiang: Plastic injection mould has high proportion, private enterprises as the mainstay. Zhejiang mould industry mainly concentrated in Ningbo and Taizhou. Ningbo Ninghai, Yuyao, Yinzhou and Cixi mainly produces plastic mould. Beilun to mainly produce die-casting mould. Xiangshan and Zhoushan mainly produce casting and stamping moulds. Taizhou manufacturing companies mainly concentrated in the Huangyan and Luqiao, plastic mould majority. 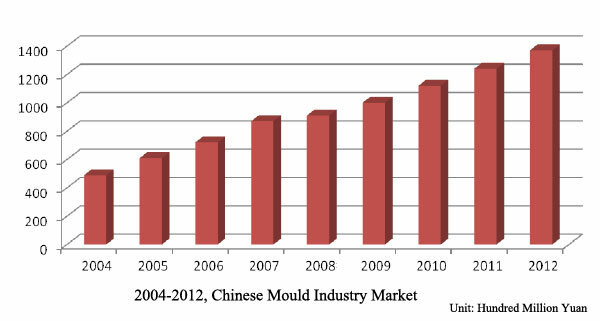 Shanghai: Majority produces mould for information and automotive industry in China. Shanghai has more than 2,000 mould making companies, employing 100,000 people. The annual production value is nearly 60 billion Yuan, an average annual growth rate of over 20%. Shanghai mould industry will face six major industries and key industries, especially information industry and the automotive industry, vigorously develop the panel dies precision magnesium alloy IT industry, die casting, precision injection moulding, automotive industry, large parts die-casting mould, precision stampings multi-position progressive. Jiangsu: Foreign private investment is the main force. Jiangsu mould factories mainly locate in Suzhou and Kunshan. Suzhou currently has more than 1,000 mould plants, mould annual sales is about $5 to 6 billion, mould industry has become one of the city's emerging industries. There are joint ventures of Japan, Korea, Singapore, Germany, the Netherlands, the United States and China Taiwan, Hong Kong, there is also a lot of private mould manufacturing companies. Anhui: A rising new force in China. Anhui currently has a number of famous mould products, such as large injection mould for washing machine and air conditioner, refrigerator mould, plastic injection mould, motor stator and rotor laminations speed progressive mould. Some product has market share of more than 30%. Mould standard parts and mould material production base has also been constructed. In addition, Shandong, Fujian, Tianjin, Liaoning, Chongqing and Hebei are developing well in recent years. During "the 10th Five-year Plan" period, mould industries first spread at the Pearl River Delta, Yangtze River Delta and then Bohai Sea region, currently accounting for about 80% of the mould concentrated in these three regions. According to the information collected by ACO Mold in Shenzhen, mould production values of over billion are mainly concentrated in the field of automotive panel mould. During "the 11th Five-Year Plan" period, the leading companies are gradually formed. For example: automotive panel mould of FAW, precision stamping moulds of Wuxi Guosheng, large plastic mould of Haier, plastic profile moulds of Tongling, rubber tire moulds of Guangdong wheel mould, Jieyang Municipal Tianyang mould, standard mould of Hong Kong Lung Kee Group and the PUNCH industry (Dalian). Foreign investment accounted for a considerable proportion of billion in mould manufacturing companies. Compared with the international advanced level, the companies' management falls behind even more than the backward technology. Develop new technology and forming mould, develop new ideas and new modes.